A newfound Earth-sized planet discovered in the habitablezone of a nearby star looks very promising for the possibility ofextraterrestrial life, but many unknowns remain. How do I say the planet?s name? Gliese 581g may look like it should rhyme with "Grease,"but it is actually pronounced as two-syllables as (Glee-zuh). The name comesfrom the German astronomer Wilhelm Gliese, who catalogued the planet?s parentstar Gleise 581 as part of a star survey first published in 1957. 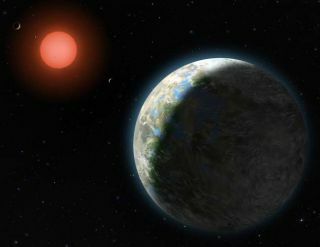 The planetGliese 581g orbits the red dwarf star Gliese 581, which sits 20 light-yearsfrom Earth in the constellation Libra. One light-year is about 6 trillion miles(10 trillion km). How far is it from the parent star? Early estimates suggest Gliese 581g is 0.15 astronomicalunits from its star. One astronomical unit is the average distance between theEarth and sun, which is approximately 93 million miles (150 million km). Thatdistance means the planet is close enough to its star so that it can completean orbit in a little less than 37 days. Think of a star'shabitable zone as the swath of space surrounding a star where conditionsfor life as we know it are possible. Closer in, a planet roasts. Farther out,it freezes. Planets within that habitable zone, also known as theGoldilocks zone, have a range of surface temperatures that allow for readilyavailable liquid water and other conditions that may support the rise of life.This cosmic sweet spot can vary, because it depends upon the type of star andthe point in time for any given star's lifespan. For instance, our sun's current habitable zone is fartherout than that of the star Gliese 581, a red dwarf about 50 times dimmer thanour sun. The cooler red dwarf allows the Gliese581 planets to orbit much closer and still remain in the habitable zone. A planet within the habitable zone does not have a guaranteedchance of originating life, because biology also depends upon the planet's sizeand a host of conditions, including chemical makeup. But what littleresearchers know about Gliese 581g makes it a highly promising candidate. How big is Gliese 581g in relation to Earth? The planet is lumped into the "nearly Earth-sized"category. It is between three and four times the mass of our Earth ? bigger,but small enough to be rocky rather than gaseous. Its radius is anywherebetween 1.3 and two times the size of Earth. How much would I weigh on Gliese 581g? An Earth-sized planet with three times the mass of our planetwould pull down on your body with three times the force of Earth's standardgravity. That means if you weighed 120 pounds on Earth, you would weigh about120 x 3 pounds on an Earth-sized planet with three times the mass, or 360pounds. But Gliese 581g also has a somewhat larger radius, so thatalso factors into the equation. A 120 pound person would weigh about 213 poundson Gliese 581g at the lower end of the size and mass estimates. This allremains theoretical until astronomers can pin down the actual size and mass. What's it like on the surface? There is no solid evidence at the moment that suggests whatsurface conditions might be like, or even if liquid water and an atmosphere areactually present. What researchers know is that the planet exists at the rightdistance from its star to have liquid water. It's also at the right distance tohave an atmosphere which can protect that water, if exists on the surface. But one of the planet's discoverers, astronomer Steven Vogtof the University of California, Santa Cruz, pointed out that "it's prettyhard to imagine that water wouldn't be there." He likened it to the examples of the Earth, its moon, Mars,and the moons of Jupiter and Saturn. He also noted that the OrionNebula is making enough water every 24 seconds to fill all the oceans ofthe Earth. Researchers also know that the planet is tidally locked toits star. That means one side experiences eternal daylight, and the other sideexperiences unending darkness. Such a locked configuration helps to stabilizethe planet's surface climate, Vogt said. 3-D global circulation models have shown that thetemperature differences on the day and night sides of the planet would not beenough for water to either freeze or boil off. They also suggest that theatmospheric circulation and wind patterns would be relatively benign. There's onecalled Pandora ? just kidding! There's no info on any moons aroundGliese 581g, or around any other planets in its solar system yet. Butastronomers have long assumed that alien planets could have moons, and thatsome of the moons might harbor life. This question depends upon how fast you travel. Given ourcurrent lack of StarTrek's warp drives, any interstellar expedition would have to travel farslower than the speed of light. A spaceship traveling at a one-tenth of the speed of lightwould reach Gliese 581g within about 220 years, Vogt said. That would allow thespaceship to begin getting close-up pictures and a sense of the planet'satmosphere. That time scale is not promising for existing humanlifespans, but robotic explorers could more easily take up the challenge.However, the fastest spaceships built so far don?t come anywhere near even thatone-tenth light-speed mark. What kind of life would we expect to find? Any discussion about alienlife on Gliese 581g is purely speculative at this point, according to co-discovererPaul Butler of the Carnegie Institution of Washington, in Washington, D.C.
Butler took a more cautionary approach as opposed to Vogt,who said his gut feeling told him "the chances of life on this planet are100 percent." Still, even Butler noted that anywhere you find water onEarth, you find life. He suggested that a similar condition should hold for almostanywhere in the universe, including Gliese 581g if it does hold water. Why doesn?t the planet have a real name? The planet is called Gliese 581g because its star, Gliese581, is designated "a," and the four previously discovered planets inthe system are called b, c, d and e.
But Vogt said that he has unofficially begun calling theplanet "Zarmina's World," in honor of his wife. What would aliens living on Gliese 581 see if they lookedtoward our sun? You remember that we don't have evidence of alien life onthe planet yet, right? But assuming they exist, aliens could spot our own sun asstar in their sky without requiring any telescopes or binoculars. If the alien astronomers had our current level oftechnology, they would be also able to easilydetect Neptune, and possibly Jupiter and Saturn.